I had an assignment this morning (Saturday, December 4) to shoot some photos at the Douglas County Historical Society’s open house and bake sale.Â Me at a bake sale…hmmm, I wondered how it was going to go. Oodles of baked goodies and me together in one room. I wasn’t so sure about it. My willpower was going to be tested to the max. Well, I shot some photos…some of a lovely lady making krumkake, others of some more lovely ladies making lefse and even more of some handsome gentlemen selling the oh-so-good-looking baked goodies. There were so many different items. And they were ALL calling my name. I have to say the distinguished looking gentlemen were doing a very good job of trying to sell me some of those deliciously tempting treats. Most, by the way, were traditional Scandinavian delicacies…Danish, Norwegian, Swedish, etc. Growing up in a German/French household, I have to say I hadn’t heard of many of the different treats, let alone tasted some them. However, being married to someone with a strong Scandinavian background, I had at least heard of and knew what lefse and krumkake was. And I have even eaten lefse before, although I am not sure if I have had krumkake. As much as I hate to admit it, lefse is not particularly one of my favorites treats. My husband, however, loves it. Well, as I was watching a demonstration of krumkake being made, and of course, nibbling on some at the same time (it was delicious! ), I noticed these little ball-shaped, doughnut-looking treats that were dusted with powdered sugar. I asked what it was and was told the little treats were aebleskivers or ebelskivers, and that there were Danish. I was told to go ahead and try one. Of course I couldn’t turn it down and so I grabbed one and took a bite. OH—-MY—-GOODNESS!!! They were SO delicious. It was like eating a balled up, kind of fluffy, but yet doughnut like, pancake. Heavy on the nutmeg, it reminded me of my mom’s super-delicious cake doughnuts. 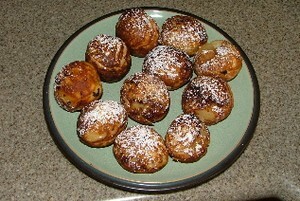 However, instead of being deep-fried like my mom’s doughnuts, these, I found out later, are made in an aebleskiver pan. Yep, there’s a special pan just to make these little balls of goodness. I really had no intentions of buying anything at this bake sale. I really didn’t. I didn’t even bring in any money. I left my purse in the car. Well, so much for that. Out to my car I went, nearly running, to get my checkbook so I could buy some aebleskivers. There was no way I was going to leave without having some. I also ended up buying some krumkake for my husband and I decided I may as well buy some sugar cookies while I was at it. Back at the office, I decided I would share my treats. I really didn’t NEED to keep them for myself. Although yes, I will admit I WANTED to keep them for myself. But I didn’t. I shared. The batter for aebleskiver usually includes wheat flour, which is mixed with buttermilk, milk or cream, eggs, sugar, nutmeg and a pinch of salt. 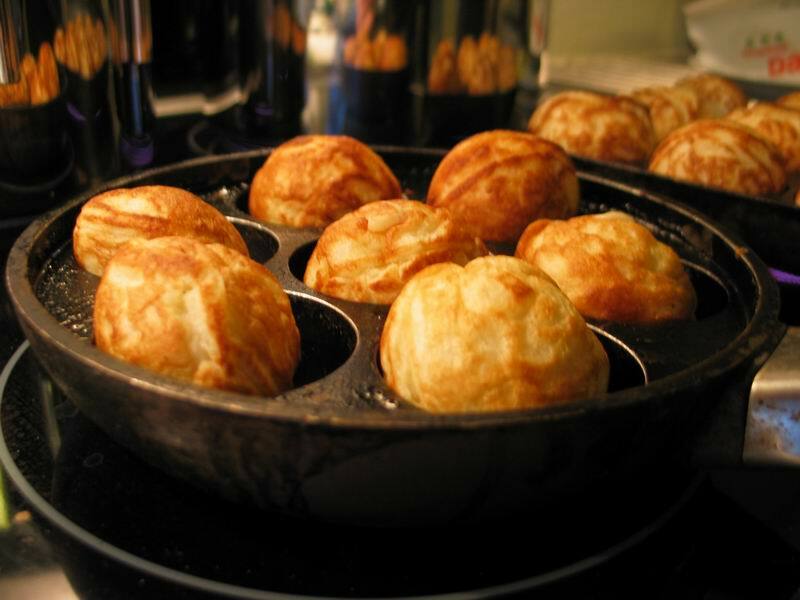 The batter is poured into the aebleskiver pan and then they are turned with knitting needle, skewer or fork to give the cakes their characteristic spherical shape. They are often sprinkled with powdered sugar and then you can dip them in different flavored jams. Well, all I know is that they were good. I think I might have to call my mom and she if she’ll make me some doughnuts. They’ll be just as good as aebleskivers…..right? Ebelscivers … yeah I have a cast iron pan but haven’t even tried ti make them in 20 years … think I will THIS year Thanks! I have subscribed to your feeds and found your blog enjoyable. Next Next post: I am baackk!! !